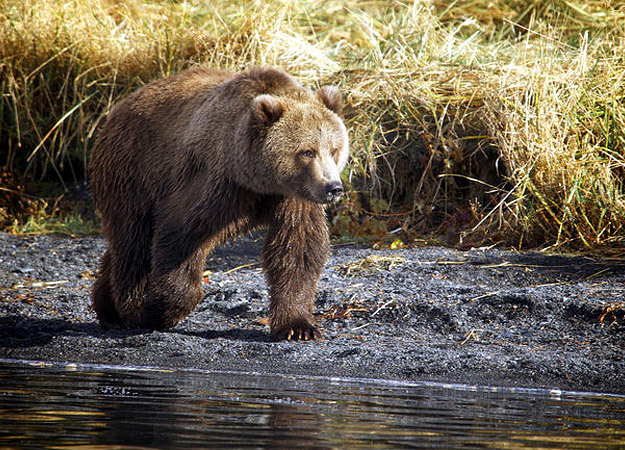 The brown bears of Kodiak Island, off the coast of Alaska, are some of the largest bears in the world. But despite their size, these bears can be amazingly graceful swimmers. Not many bears chose to catch their salmon in a deep lake, but a handful do, and we were able to film, for the first time ever, exactly how they do it. Our cameraman, Nick Guy, came up with a remote-control floating camera in a submarine-shaped casing that was capable of going underwater. We had wondered whether the bears went down feet first, but the sub confirmed that they dived head first to depths of up to twenty feet (6 m) and picked up fish with their paws, before returning, back legs tucked underneath, to the surface. All the bears were females and had refined diving skills that are rare in bears. They were driven to learn these new skills in order to feed their cubs. Being able to go up and down into the lake helps both mother and cub to fatten up before hibernation.